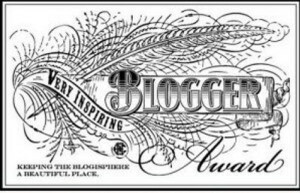 Thanks to a lovely dutch sailing woman, I have been nominated to the VERY INSPIRING BLOGGER AWARD. I am writing this blog to remind myself of the beauty I saw during my travels and my everyday life (which is sometimes harder to recognize … but it is there for sure). To be nominated to the award really is an honor to me. I enjoy writing this blog for myself, but if I get to inspire people with my SUNDAY BLOG, it means so much more to me. I love sports and just got to know yoga recently, which really helps me to calm down and listen to my body. I love going out with my friends. Finally I found a job which enables me to not just work during the week, but to also see my friends and enjoy a social life. See these beautiful blogs, which have inspired me a lot and therefore are my nominees for the Very Inspiring Blog Award. HOVERCRAFT DOGGY – Art, Architecture, Design and Photography Blog – to inspire and brighten up your every day. MY ROAD TO HAPPINESS – al little piggies’ attempt to change for the better, come along for the ride..
Congrats on the award. I remember when I got my first Monday-Friday job. It was a victory! It freed me up to spend time with friends. Thanks for nominating my blog.